This table is used in forwarding to process Interests with Link objects. 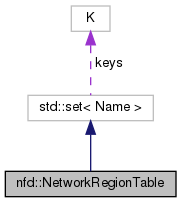 NetworkRegionTable exposes a set-like API, including methods insert, clear, find, size, begin, and end. Definition at line 40 of file network-region-table.hpp. If any delegation name in the forwarding hint is a prefix of any region name, the Interest has reached the producer region and should be forwarded according to ‎its Name; otherwise, the Interest should be forwarded according to the forwarding hint. Definition at line 32 of file network-region-table.cpp.